Exclusive! Are these the 2019 MA Tees? Moments ago, an anonymous tipster sent these three screen shots. This tipster (or tipsters) alleges (or allege) that he/she/they had access to the top secret Mission Adventures workshop where the MA Gnomes™ are hard at work on the 2019 MA Gear. While we can’t say for certain, these images do seem authentic! Could a pigment-dyed ombre garment be in our near future?! Stay tuned for more information coming your way soon! Not One, Not Two, but THREE Themes for 2019! Our Brasilian brothers and sisters have called their first theme, Paradoxo, (paradox, in English), and they are excited to illustrate how God brings hope through crazy ideas that don’t seem to make sense at first. Check out the Paradoxo page for more info including a super awesome theme statement! Our European friends are playing off the craftsmanship concept in Ephesians 2 and using the amazing Japanese artform of Kintsukuroi to help students visualize how God is repairing their lives and the world around them. Check out the Kintsukuroi page for more! Our North American partners are using God’s identity as the big idea that is changing the world. Who we are can only be truly understood through who He Is, and it’s this journey of discovery that makes all the difference. Check out the I Am page for more, including a theme statement. I just love that God is so creative and inventive that he’s given us three themes for 2019. I love that we get to use these themes to help students experience who he is, what he’s like, and what he is doing in the world. As more resources are developed, we’ll make them available on the theme pages… so stay tuned for even more theme-y goodness! Wahoo! African students are participating in Mission Adventures! "With joy-fullness we write to share something very special with you and Mission Adventures! My wife Rossana and I have worked with Mission Adventures since 2014 in Porto Velho. But lately we share our time with DTS, which I am co-director with her. We were in the last waves in Thailand, maybe you remember us. Today we are in Maputo, Mozambique, and at the YWAM base here there is a beautiful project with youth of low social class. And we just felt right to run a Mission Adventures outreach here, we felt peace. Leaders from YWAM Maputo and Porto Velho encouraged us and supported us in everything. And that’s how the first Mission Adventures campaign happened in Africa, here in Maputo! It was simply beautiful, we saw God at work, he prepared every detail. The most amazing thing was to have Francisco, the leader of YWAM Mozambique as our preacher about passion on the first day. He showed us that no matter our origin, God is determines our futures, as we let Him. Francisco belongs to the most underestimated tribe in Mozambique, but today he’s a reference for Mozambican. It was a week rich and significant for each young man, and as for YWAM Maputo it’s a start, and we believe it is the beginning of Mission Adventures in Africa. Seasons by Hillsong is a great song that fits perfectly with our Thrive theme! I encourage you to use this song to bring the Thrive theme to life for your students! I came across this article by Alec Appelbaum about his family's tradition of an annual Christmas Eve scavenger hunt. This got me to thinking that this is a fantastic idea for you to use with your teams. You can send your students out to talk to the people in your outreach location. Give them a list of things to find that will help them to experience the place and the people. Use a list that mixes conversation with observation and orientation. I like to include a few gimmes—things like a bank branch or a vacant lot—along with storefronts or parks with unusual spellings or striking scenery. Mix these with autographs from people you’ll likely actually meet (public servants, baristas, dog walkers, whatever) and the hunt picks up its rhythm. Go where people aren’t driving. Walk around. Cross zones or borders. Go over a bridge, through a tunnel, from one side of an eight-lane to another. Talk to people. And listen to them as well. If they ask why you want to know something, explain. Say please and thank you. Don’t treat them as props or ask them to fuss over you. Ban consulting screens, but accept help from people who themselves talk to Siri. Gather facts from diverse people. Opinions and styles will come out anyway. You might find racism. I hope you wouldn’t, but you might. And you might find a way to zap it when you do. It’s all a matter of looking in layers—the horse could be on a Budweiser truck or the awning of a bar, or a cop could be riding it. Keep looking for answers, and for input. You may end up helping someone feel appreciated, or at least helping someone engage with the day. If you're already doing something similar in your location, please comment below and tell us about how you do. We've done dramas. We've done dances and puppets. We've used Evangecubes and, The Four Spiritual Laws tracts. We've even done gospel illusions.And frankly I think all these things have gotten a bit stale. We are overdue at taking our next steps in evangelism. It's time we develop something fresh. I'm convinced it's time we learn to teach our students how to tell Bible stories. Telling stories can be done back home after outreach is over. Want to know more? Here's a white paper filled with ideas and resources that can help you get started! Epic Faith for Your Students! Here's a one minute video of a few of the photos I took at our WAVES Gathering in Thailand. Enjoy! Two Travel Resources that Can Save You Money! This is an email list, (I know, right?! How 90's!). Every couple of days Scott sends me an email with some insane cheap fares to random places around the world. Scott focuses on international flights from the USA. There's a premium list that gets the info earlier… for $15/quarter or $39/year. You gotta act fast because the fares Scott finds don't last long! If you're in the US, you can't lose by signing up for the free one and if you find it working for you, upgrade! This is a site (that also has an email list) that focuses on how to compare and maximize all those frequent flier programs. 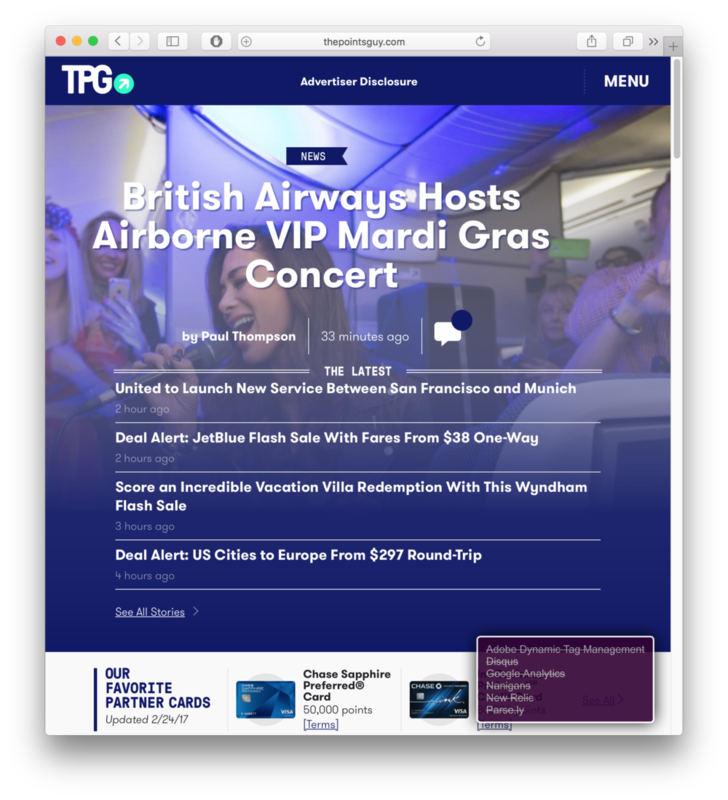 TPG tends to focus more on the premium end of the points world and not so much on the budget end. Again, pretty US focused, but still lots of info that would be useful if you live outside North America. Again, you can't go wrong by signing up for the Deal Alert email list and seeing if it's helpful to you. The fine folks at our Secret Northwest Production Facilities™ just press checked two of our tee shirt designs. And a bold operative got a couple pics and took great risk to get them to us! Aren't they gorgeous? Soon finished shirts will be winging their way to our partners who are running Spring Break programs. Please join us in prayer for the students who will receive these great tees and for the wonderful people they will meet on their adventures! I just got a bunch of photos from our friends at Purnaa! It's so cool to see our backpacks in process—and to know that this partnership makes a difference in the lives of the folks in the photos is exciting. As you know this isn't just about a financial transaction, this is all about transformation! The Backpacks Are Awesome & On Sale! These Mission Adventures Cinch Sacks are made of 100% Nepali heavyweight cotton canvas. I love that these are grown and sewn in Nepal, that means the price we pay for these bags benefits more people in Nepal as they rebuild their nation. What if we make a premium tee—three colors of ink on the best garment we can afford? All this was happening while I was designing the stickers. (That's another long story). And when the wolf sticker came together, I was all <hearts for eyes emoji> but my initial reaction was, awwwwww... too cheesy and literal for the Rockhound theme. (Rock-HOUND, get it?!) But it wouldn't go away. I showed it to a few theme teamers and they were all <hearts for eyes emoji> too. I took that as a sign, and I said to myself, "What if we make a premium tee—three colors on the best garment we can afford?" Let me tell you about these garments. First off they're the lightest garments we've ever done, 4.2 ounces. Now it's not so light as to be sheer, so we're safe there. (And we've chosen darker colors too, because the design works better on darks, and well, safety). The fabric is even softer than the Retro Tees. It has something to do with the cotton being combed, (which I can sort of wrap my brain around), and "ringspun", (my brain can't really seem to imagine what that might mean). All I really know is that combed, ringspun cotton is really soft. The fit is a fashion fit, so it's just a little more snug, and definitely on-trend. And it has features—things like side-seaming, set-in neck, and retail sleeves that don't wing. These garments are crafted. And did I mention that these are heathered? I know, right?! It seems like heathered colors are everywhere! This is that extra bit that really puts these tees over the top. These garments are precisely 52% cotton and 48% polyester. The heather texture visually softens the tones and sets the design off so nicely! And the heather feel is oh so soft and smooth! And I figured, hey, if there are three colors of ink, why not offer three colors of garments?! Seriously, doesn't that design just fit these garments? I know these are a little more expensive. But these are the best tees we've ever offered. They make perfect staff shirts, and maybe you could honor the team leaders by giving them one of these instead of the others. Or maybe you want to pick a couple up for the leadership team on your base to get them excited about your ministry. You won't regret giving these tee shirts to your people. What If We Made A Tee that was Super High Quality but less expensive than last year? My problem is that I like options more than I like decisions! This screenshot shows pretty much my whole process in designing this year’s Rockhound Tees. Over the next few days, I’m going to give you a special sneak peek behind the scenes to show you how we ended up with three different tee shirt designs this year! My process is pretty iterative. If you zoom in, you’ll see that I tend to tweak and explore multiple versions of nearly the same thing. I go until I either see that the design works or it doesn’t. Then sometimes I go some more, haha! Tomorrow I’ll share with you how the Green Diamond Tee came about! Stay tuned! While the Green Diamond tee was coming together, I explored this widened pentagon shape. I arced the top, and it just seemed to evoke national parks. I added some stripes and tried 17* different variations of the word, ROCKHOUND in it... And it seemed to reflect a cool, outdoorsy, 1970's retro vibe. I originally did it in five colors, thinking it would be a sticker. But then I slapped it on a tee shirt mockup. And I liked it. So I showed it to a couple of the Theme Teamers to get their take. The reaction was nearly instant: OoOooOooouu! Which I took to be positive. I admit, part of the charm of this design was that there were so many colors. (Check out some of the early iterations in the screenshot in Part One below) So I decided to see if it could look as good with just two. And I was beginning to think that maybe I could offer two shirts, the Green Diamond tee, and this Retro tee. The garment I chose for this tee is a little bit softer and quite a bit lighter than the Green Diamond shirt. (4.5 ounce... yes that .8 ounce really does make a difference!) And the fit is more fashion-oriented, much closer to a tee you'd find at the mall. It's very comparable to tees we've used in the past. And it's a bit more expensive, but I think it's worth it. You'll note that there's more than one garment with this one. I couldn't decide which color. Then I thought, "Why decide? The same ink colors look amazing on both!" So now you can choose! This way you can give that cool kiwi green to your students and the sand tees to your staff and volunteers! (Or the other way around—whichever feels better for you!) Or maybe you don't like green. (2017 is gonnu be a bummer for you—sorry! It's the Color of the Year.) Good news, go with sand! *This is an exaggeration, but not by much. I still wasn't done. Tomorrow I'll tell you all about the three-ink, three color Wolf Tee! From the beginning, I knew we needed a one-color design. And that meant that the art needed to be solid—something with a lot of texture, that captured the Rockhound vibe... Those crossed rock hammers were the first graphic device I made. And the faceted gem just begged for radiant lines to come out of it—you know what I mean? And the repeating arcs of Mission Adventures and Youth With A Mission echo the gem-sun. Plus, the mono-weight lines are so right now and contemporary and fresh. A tee is more than solid art. I needed a high-quality garment that would show off the design, and at the same time, be a bargain. Pencils were sharpened. Math was done. Spreadsheets were employed. 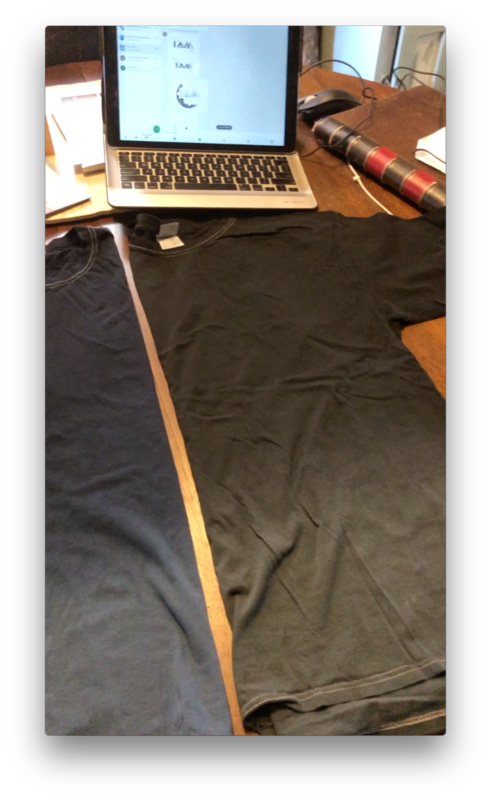 Samples were sent in multiple colors. Most were rejected, but we had one stand out. Not only was it a great color—that eye-catching green that is the Color of the Year for 2017, but it was relatively inexpensive. It's not cheap, mind you. I don't go for that. Value is my jam—highest quality for reasonable price. And that's why I'm pleased to offer the Green Diamond Tee. This is a high-quality 100% cotton garment. It's a little bit heavier weight than the others. (The really heavy tees are 5.5-6.0 ounces; this one is only 5.3 ounce). The cut of the garment is a classic fit, so it's a little bit roomier. The bright green shirt really sets off the cream colored ink. I know your students are gonnu love this tee! And it's less expensive than last year! Up Next: The Inside Story on Our Brand New Rockhound Retro Tees! A few weeks ago, the YWAMers in Hong Kong launched their brand new Mission Adventures ministry! They hosted two cycles of teams from Singapore. I just wanted to let you know that the 2 sessions we ran with Mission Adventures was a success! We have people saying the trip changed their hearts for Missions, the poor, and will become missionaries themselves or be an advocated for the people of Hong Kong! God has touched so many lives through our efforts. Join with me in thanking him and asking him for more in 2017! In Japanese, tsundoku means that stack of books you've been meaning to read. My stack keeps getting bigger and bigger! Last week at our North American Theme Extravaganza™, we went around the room and shared about our work, our lives, and what God is up to with us. As part of that, we shared about what we've been reading. It was really inspiring to hear what different ones of us have been inspired by, and so I thought I'd share it with you here so you can be inspired too! I'm definitely adding a few of these to my pile! Hebrews by Some think James, others Bartholomew others Peter so who knows? This is what a mile of Nepali cotton canvas looks like! So we did it! We ordered up thousands of super awesome String Backpacks from Purnaa, our partner in Nepal. We sent a down payment and then got word that they're already at work on our bags! Check out that pile of fabric—that's a linear mile, 5,280 feet (1,609 meters), of fresh 100% Nepali cotton! Soon the employees of Purnaa will be cutting and sewing! If you're not sure what we're talking about, then you probably missed our announcement about our partnership with Purnaa. Check it out here! And if you haven't already, be sure to visit Purnaa's site to learn more about their amazing, clean, and ethical business!